The World Wide Web (WWW or Web) is a global collection of connected documents and other resources that reside on the Internet. The introduction of the Internet of Things (IoT) is expected to dramatically increase the size of the Web in the near future and thus necessitates a fundamental change to the existing mechanisms of discovering resources. In IoT, the vision is that a significant number of new types of devices (or “things”) such as fridges, car sensors, traffic lights, and so on, will be dynamically connected to the Web for communication and control. These IoT devices will have radically different characteristics from existing Web servers and users. 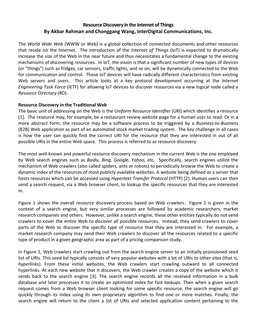 This article, written by Akbar Rahman and Chonggang Wang, InterDigital Communications, Inc., looks at a key protocol development occurring at the Internet Engineering Task Force (IETF) for allowing IoT devices to discover resources via a new logical node called a Resource Directory (RD).